Even before Prime Minister Manmohan Singh landed in Moscow for his three-day official visit to Russia, the BJP cut out a high-priority task for him — to sack Home Minister P Chidambaram through fax or e-mail. Wails of grief shook West Bengal’s Sangrampur and neighbouring villages as the toll in the state’s worst-ever illicit liquor tragedy shot up to 143 amid fears that this might rise further with over 100 victims, including labourers, rickshaw-pullers and hawkers, battling for life. Prime Minister Manmohan Singh said on Thursday that India would fulfil its commitments to Russia in the civil nuclear energy field and at the same time address the concerns being expressed in Tamil Nadu over the Russian-supported Kudankulam nuclear project. Tejendra Khanna, Lieutenant Governor of Delhi, has revoked the withdrawal of prosecution against hotelier SP Gupta, the owner of a five-star hotel in central Delhi. Ahead of a special Cabinet meeting on Sunday, the Congress is trying hard to build consensus on party president Sonia Gandhi’s pet project, the National Food Security Bill, decision on which was deferred by the Cabinet in its last meeting following opposition from key UPA allies, the NCP and the Trinamool Congress. With 17 party MPs from the state calling on senior most BJP leader L.K. Advani party president Nitin Gadkari, the BJP is under renewed pressure to restitute former Karnataka Chief Minister B.S. Yeddyurappa to his position of pre-eminence in the state. Uttar Pradesh Chief Minister Mayawati today asked the police officials to crack down on anti-social elements in the state, and warned of stern action against officials found lacking on law and order front. Government’s confirmation of lack of consensus among different political parties on various issues pertaining to Lokpal Bill and subtle hints asking Anna Hazare to be remain patient have prompted the activist to unveil his plans for the new year. Faced with an unprecedented exodus of doctors from a government hospital at Kokrajhar in western Assam that was triggered by a threat from insurgents, the state government has warned of enforcing the Essential Commodities Maintenance Act (ESMA), if required, to make doctors attend to their duty. The state government has also given an assurance about augmenting security. The outrage over the fire tragedy at Kolkata’s AMRI hospital has prompted the authorities in Andhra Pradesh to take stock of the safety conditions in hospitals across the state and crack the whip against the callous managements. Bharat Dynamics Limited (BDL), the missile production arm of the Defence Research and Development Organisation (DRDO), will set up a new unit to manufacture short-range missiles for the armed forces. Lok Sabha member Umashanker Singh today tripped in the Lok Sabha while trying to hand over some documents to the Speaker. He fell while alighting from the steps around the Speaker’s seat and was helped by fellow MPs and chamber attendants before being rushed to Ram Manohar Lohia hospital. The Delhi High Court today quashed the trial court order naming Samajwadi Party MP Rewati Raman Singh as an accused in the 2008 cash-for-vote scam case. Kerala and Tamil Nadu today shot down in the Supreme Court each other’s proposal on the row over the Mullaperiyar Dam, effectively preventing a Constitution Bench of five Judges and the Centre from adjudicating or resolving the issue. Bollywood producer-director Ram Gopal Varma is planning a movie on the 26/11 terror strikes in Mumbai, capturing the “behind-the-scene” heroism of police officers and the trauma of survivors. Former Chief Minister BS Yeddyurappa’s success today in getting 17 out of the 19 BJP Lok Sabha members from Karnataka to throw their weight behind him has given a fresh boost to Nationalist Congress Party (NCP) leader and Union Agriculture Minister Sharad Pawar’s plan of roping in the Karnataka strongman into the NCP to improve the party’s tally in the next Lok Sabha elections in 2014. In a shocking incident, a pregnant woman was administered HIV-infected blood during Caesarian operation at a private hospital in Nellore district of Andhra Pradesh. The woman later tested positive for the deadly virus, causing immense trauma to her and her family. “These days, the PM doesn’t have to wait to return (to send a message). He can fax or e-mail (it). After all, the President has signed and faxed imposition of President’s Rule in states earlier,” he said when reminded that the PM had just left for Russia and not even reached Moscow. 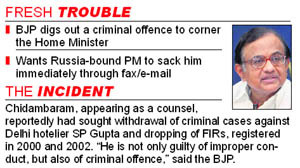 Sinha claimed that as Home Minister Chidambaram had recommended the withdrawal of FIRs against one SP Gupta, registered in 2000 and 2002, for whom he had appeared as a counsel, this amounted to a criminal offence. The party had disrupted the proceedings in Parliament today demanding the dismissal of the Home Minister. “We will continue our protest (against Chidambaram) till the Prime Minister makes a statement in Parliament and dismisses Chidambaram,” said the senior BJP leader. “I did not say we will disrupt Parliament proceedings,” he said when asked how they expected Parliament to pass the Lokpal Bill if they continue to stall the House. Sinha said the BJP believed that Chidambaram misused his office to push the case of a criminal. He is not only guilty of improper conduct, but also of criminal offence. Earlier in the day, BJP members disrupted both Houses of Parliament demanding the sacking of Chidambaram resulting in the Lok Sabha being adjourned for the day while the Rajya Sabha witnessed disruptions right at the commencement of Question Hour. In both the Houses, BJP members created ruckus, flashing copies of a local daily that had reported Chidambaram helping out a local hotelier SP Gupta in seeking withdrawal of criminal cases against him and dropping of FIRs, whom Chidambaram had once represented as a lawyer. Curiously, it was the daily’s Editor-in-Chief Chandan Mitra who raised the issue in the Rajya Sabha. He is a national executive member of the BJP. The unruly scenes forced Chairman Hamid Ansari to adjourn Question Hour. Immediately, Congress members were on their feet displaying copies of another newspaper which carried a report that a trust, with Anna Hazare as a member, had allegedly grabbed land in Pune. Ansari kept asking the agitating members to relent and not flash copies of newspapers in the House, but to no avail. He had to ultimately adjourn the proceedings. The Lok Sabha was also adjourned on the issue first at 12 noon until 2 pm and then at 2 pm for the day. The victims fell ill after consuming spurious liquor from several illegal joints on Tuesday night. Preliminary investigations suggest that the deaths occurred due to methyl alcohol toxicity that led to respiratory and cardiac failure. Officials said 103 deaths were reported in Diamond Harbour sub-divisional hospital, followed by MR Bangur (36) and National Medical College and Hospital (4). Condition of about 50 victims was critical at the three hospitals, doctors said. The toll was likely to go up, they added. “Many are still battling for life in the three hospitals after consuming spurious liquor,” the CMO(H) Shikha Adhikary said. 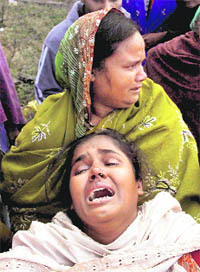 The issue figured in the state Assembly with Chief Minister Mamata Banerjee announcing a CID inquiry into the tragedy that took place less than a week after the major fire at AMRI that left 93 dead. The police said 10 arrests had been made in connection with the hooch tragedy. The Chief Minister said the owner of the liquor den Badshah Khokon, named in the FIR, was absconding. “India has always regarded Russia as a partner who was with us in times of difficulty and even when there were restrictions on nuclear commerce with India,’’ he said in an interview to the Russian media. 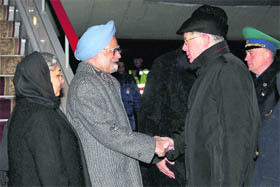 The PM left this afternoon on a three-day visit to Moscow for the annual India-Russia annual summit tomorrow. Referring to the ongoing protests against the Kudankulam project, he said the government took the concerns of the people seriously. It had set up an independent group of experts to respond to all the legitimate and genuine concerns of the local people. Talking about the India-Russia defence cooperation, Singh said it has always been an important pillar of the strategic partnership between the two countries. “Russia is India’s largest supplier of defence equipment and a most reliable partner. Over the time the nature of our defence relationship has changed from one of ‘buyer seller’ to that of being partners in joint development of systems and in search and development,’’ he noted. New Delhi would like this trend to gain further momentum. The Opposition, led by the BJP, today disrupted proceedings of both Houses of Parliament seeking the removal of the Home Minister for having favoured the hotelier. However, Home Secretary RK Singh said that Chidambaram had no role in the hotel controversy. Since 1999, the owner of a five-star hotel, SP Gupta, and his company Sunair Hotels, have been involved in a series of legal disputes with VLS Finance Ltd, a company which claims to have funded the project. P Chidambaram is said to have represented Sunair Hotels in the high court in a dispute. opposition from key UPA allies, the NCP and the Trinamool Congress. Food Minister KV Thomas today held consultations with key ministers ahead of a crucial meeting on Sunday, apprising them of the salient features of the proposed law. He met National Conference leader and New and Renewable Energy Minister Farooq Abdullah and apprised him of the salient features of the Bill. Tomorrow, he is expected to meet NCP leader and Agriculture Minister Sharad Pawar, who has opposed the Bill citing increased subsidy bill as the reason. Pawar, in fact, believes that since several states have opposed the Bill, the government should discuss the Bill at length before tabling it in Parliament. “The government is committed to bringing the food Bill. It’s a serious issue. Its implementation is a big responsibility of the state governments. We will take a decision here, but the state governments would be the one to implement it,” the Agriculture Minister has been quoted as saying. The Trinamool Congress has written to Prime Minister Manmohan Singh, asking for more time to discuss the Bill. The problem is that after the Bill is implemented, the food subsidy cost may rise to around Rs 1.2 lakh crore from the existing Rs 63,000 crore and the food grains requirement might go up to 70 million tonnes from the current 55 million tonnes. A senior Congress leader said the cost of the Bill, along with setting up procurement and distribution mechanism, could be “perilous” for the country’s economy at the time international economy was in doldrums. He said not many changes were expected in the new draft, which was a cause for worry. Incidentally, Thomas today also called on party colleagues Power Minister Sushil Kumar Shinde, Science and Technology Minister Vilasrao Deshmukh and Corporate Affairs Minister Veerappa Moily to explain the contours of the Bill on which the Congress-led UPA hopes to ride back to power in 2014. However, several state governments, including those ruled by the Congress, have complained to the food ministry about the negative impact of the Bill on their already-stretched finances. Bihar has termed the Bill as “unilaterally imposed, creating a substantial financial burden on the state government” while Kerala, which has a Congress-led government, along with Tamil Nadu and Orissa, have raised apprehensions about the likely financial burden on the state from the food security law. The food Bill aims to provide 75 per cent of the rural households with subsidised grains. Of these, “at least” 46 per cent households would be considered as “priority” category and each person in these households would get 7 kg of grain a month at subsidised rates - Rs 2 for a kg of rice, Rs 3 for wheat and Re 1 for coarse grains. The priority households in urban areas would get “at least” 3 kg subsidised grains per person per month. Along with 17 MPs and some other state unit leaders, Yeddyurappa, currently in the Capital, met, among others, chairman of BJP parliamentary party L.K. Advani. The party has only 19 MPs from Karnataka and one of them Ananth Kumar is his biggest political rival. Sources said the Yeddyurappa group mentioned to Advani how the recent Bellary by-elections proved the indispensability of the Lingayat leader of the state. While it is not clear whether Yeddyurappa is seeking the post of state president or full restitution as the chief minister, his camp followers merely stressed upon his pre-eminence and indispensability for the BJP in Karnataka and are stressing only this point in their meetings both with Advani and Gadkari. Sources close to Gadkari claimed that Yeddyurappa wanted the state BJP president post. The Central BJP leaders asked him to quit following a damaging report of the state Lokayukta Santosh Hegde on illegal mining in the state. After he was left with no other option, he bowed out on August 1. Before Advani started his countrywide rath yatra against corruption, Yeddyurappa was arrested. Throughout the yatra, he remained in jail with his camp followers virtually boycotting Advani’s public rally in Bangalore. Soon after Yeddyurappa’s release on bail, the Bellary Assembly bye-elections took place with sitting MLA B Sriramulu quitting the BJP and re-contesting against his former party. Yeddyurappa pointedly stayed away from the campaign. The BJP lost badly. He demonstrated his clout again last week when he forced Chief Minister Sadanand Gowda, his protégé, to postpone his election to the state legislative council by a day, just to impress the party high command. Sources said Yeddyurappa finally agreed to allow Sadanand Gowda to get elected after he was offered a deal ensuring respectable rehabilitation. Now he is here to extract his pound of flesh. Considering Advani to be the biggest hindrance to his plans, he met him first before calling on others. He also met Leader of Opposition in the Rajya Sabha Arun Jaitley. * Yeddyurappa’s supporters say that Bellary election had proved his indispensability. The Chief Minister instructed police officials to initiate strict action against "goonda, mafia and anti-social elements and those creating communal troubles," an official release issued here said. Mayawati, after a review meeting, also asked the district magistrates to prevent illegal mining in the state, the release said. An angry Anna on Thursday announced a “jail bharo” agitation from January 1 and an indefinite fast, either in Mumbai or Delhi, depending on the weather, from December 27, while the government tried to placate him by saying that the contentious Bill would be passed this winter session. Meanwhile, a key member of his team told The Tribune that Anna may be willing to postpone his plans if the government tables the Bill before December 22, extends the winter session and takes it up for discussion, after a short Christmas and New Year break, in January. For now, the time is running out for the government and with just five days to go before the winter session ends (So far, there is no official confirmation of the session extending beyond December 22), the social activist stumped the Congress-led UPA with yet another threat- that from the first day of the new year, supporters of Jan Lokpal Bill would sit outside the houses of MPs of the parties that have opposed the anti-graft Bill and force the government to arrest them and put them in jail. Claiming that all efforts were being made to reach a consensus on the Lokpal Bill, the Congress advised Anna to remain patient and calm. “There is no need to hurry as attempts are being made (by the government) to harmonise and reconcile divergent views,” Congress spokesperson Manish Tewari said. Sources in Team Anna say that next on Team Anna’s agenda is Land Acquisition Bill, which is currently being examined by a Parliamentary Standing Committee. Anna today formed a four-member committee comprising Arvind Kejriwal, Prashant Bhushan, Medha Patkar and Devinder Sharma. The team would study the Bill and launch a countrywide awareness campaign against sticky points in the Bill, tackling an issue that is very close to social activist Medha Patkar’s heart. “Anna said the Bill (Land Acquisition) is no less important than Lokpal Bill,” a key member of the core team said. But while Team Anna spreads its area of interest, the focus for now will remain the Lokpal Bill. Team Anna wants that the ongoing winter session of Parliament should be extended, a demand that the government may have to concede if problem areas are not sorted out by Sunday. Another option is to reconvene the winter session after a short break. Team Anna sources said they were open to the idea as long as the government presented before the break in Parliament a Bill they were satisfied with. * An angry Anna on Thursday announced a "jail bharo" agitation from January 1 and an indefinite fast, either in Mumbai or Delhi, depending on the weather, from December 27. * The government tried to placate him by saying that the contentious Lokpal Bill would be passed this winter session. * Sources in Team Anna say that next on Team Anna's agenda is Land Acquisition Bill, which is currently being examined by a Parliamentary Standing Committee. Assam Health Minister Dr Himanta Bishwa Sharma said that the ESMA was an option that was being considered to make the important government hospital in Kokrajhar function where all the 28 doctors had fled on Sunday without serving any notice to the authorities. Some of them had got extortion demands over the phone from persons who identified themselves as members of the anti-talks faction of the outlawed National Democratic Front of Bodoland (NDFB). The doctors’ exit left the patients of the hospital high and dry. Though the government managed to facilitate skeletal service in the hospital by bringing seven doctors from other hospitals in the state, the situation remained far from what is desired in the interest of treatment of patients. Dr Sharma said doctors should be mentally prepared to serve under tough conditions while the government would provide them better security. He said the fleeing of doctors from RN Brahma Civil Hospital in Kokrajhar would send negative signals for the process already undertaken to set up a medical college and hospital in the western Assam hub. Meanwhile, the police has arrested four youths suspected to be members of the NDFB in connection with the extortion demand. AP is often projected as a leading destination for “medical tourism” in the country because of the presence of a large number of corporate hospitals, particularly concentrated in and around Hyderabad. However, a quick inspection of the facilities at these hospitals revealed disturbing details. The officials were dismayed to note that only 20 per cent of the 580 private hospitals in the capital city have installed fire safety equipment and obtained No Objection Certificates (NoCs) from the authorities concerned. The reports from other cities like Visakhapatnam, Vijayawada and Tirupati were much more disturbing. Taking lessons from the devastating fire in Kolkata, the Greater Hyderabad Municipal Corporation (GHMC) has set a one-month deadline for the government and private hospitals under its jurisdiction to install fire safety equipment. “We will not hesitate to seal the hospitals and cancel their registration if they continue to put the people’s lives in danger,” the GHMC Commissioner MT Krishna Babu said. In a bid to send a strong message, the authorities would seal at least three major hospitals within one month if no steps were taken by the managements to install the equipment. After a fire accident at a corporate hospital in the city in February last year, the GHMC had slapped notices on the hospitals having less than 50 beds. But only 20 per cent responded positively while the rest ignored the notices. As many as 91 hospitals having a capacity of more than 50 beds or housed in five or more floors in a building, were also served notices. Of them, only 17 installed fire safety equipment and obtained NoCs. The new facility will be located at Nandgaon Pet in Amaravati district of Maharashtra. This is the first BDL unit to come up outside Andhra Pradesh. The BDL has two missile units in AP located at Kanchanbagh in Hyderabad and near Bhanur in Medak district. They are engaged in manufacturing a wide range of missiles including the long-range surface-to-surface ballistic missile, Agni, to meet the requirement of the Army, Air Force and the Navy. According to BDL officials, the mini ratna company under the Defence Ministry plans to produce Very Short Range Air Defence Missiles (VSHORAD) for the armed forces at the new unit in Maharashtra. An area of about 530 acre has been acquired for the missile unit. Initially, BDL plans to invest Rs 250 crore for the new unit which is expected to generate employment for 1,000 people, Maj Gen Ravi Khetarpal, Chairman and Managing Director of the company, said. The company was on a rapid expansion mode and was set to achieve its all-time high turnover of Rs 1,000 crore this financial year, he said. Meanwhile, two more missile-manufacturing units are expected to come up in AP’s Anantapur and Ranga Reddy districts at a combined cost of over Rs 1,400 crore. As part of new industrial policy 2010-15, the state government would facilitate establishment of missile production units and has already allotted 1,100 acre land in both the districts for the purpose. A Rs 600-crore facility will come up near Bhagayat village in neighbouring Ranga Reddy district over an area of 500 acre. The Maharajganj member of Lalu Prasad’s Rashtriya Janata Dal was said to be stable. His family members said he was recovering. Singh’s son clarified that his father had not suffered a brain haemmrohage. Speaker Meira Kumar visited the MP in the hospital and enquired about his health. Justice Suresh Kait passed an order to this effect on a petition filed by Rewati Raman Singh challenging the special court’s October order. The trial court had also summoned him to appear before it as an accused. Rewati Raman Singh had contended that he had been given a clean chit by the parliamentary committee as well as the Delhi police which filed three chargesheets without naming him as an accused. On November 16, the high court granted bail to six persons accused in the scam, observing that they appeared to have participated only in a sting operation as there was no prima facie evidence to show that bribe was demanded and paid. Tamil Nadu vehemently opposed Kerala’s proposal that the SC should ask Prime Minister Manmohan Singh to convene a meeting of the Chief Ministers of the two states, while Kerala objected to its neighbour’s demand for the deployment of the Central Industrial Security Force (CISF) for ensuring the safety of the dam. Taking note of the rigid stands taken by the two states, the Constitution Bench headed by Justice DK Jain said it could request the PM to convene a meeting only if both the states were willing for such a dialogue. On its part, the Centre said it could not deploy CISF without Kerala’s consent. Constructed during 1887-95 , the dam is now located in Kerala, but its water is being utilised exclusively by Tamil Nadu which is controlling and maintaining it under a 999-year lease agreement signed between Madras Presidency (part of which has now become TN) and Travancore State (now Kerala). While Kerala is seeking reconstruction of the dam as any breach would flood its areas, Tamil Nadu says the dam is strong and safe. Tentatively titled “26/11”, the action flick would attempt to tell the story of the terror attacks from the perspective of a man who inadvertently transported the terrorists on a trawler to Mumbai. “It will be a realistic depiction of the dreaded attack. It will also focus on the man who ferries these terrorists to Mumbai and how he reacts after he discovers that his passengers were actually terrorists after seeing their pictures on the news the next day,” Varma said. Known for his movies depicting the urban underbelly, mafia killings and political violence, Varma says 26/11 would be a big challenge for his film career. “After my tryst with the so-called underworld films, I would consider this film as the greatest challenge of my career,” says the maker of “Satya”, “Company” and “Sarkar”. Varma triggered a major controversy when he visited the Taj Mahal Palace and Tower Hotel soon after the 26/11 terror attacks along with the then Maharashtra Chief Minister Vilasrao Deshmukh, his son Riteish Deshmukh. The director faced a barrage of criticism for taking a “guided tour” of the terror-hit hotel and displaying insensitivity. However, he had denied that his visit to the Taj was a recce for a movie project. “I just happened to be there. I was not part of the Chief Minister’s team, nor was I invited by him,” he said. After over three years, Varma has announced his plan to bring to the celluloid the trauma of the 26/11. “Everyone more or less has seen or heard of what happened during that time. But my attempt now would be not only to capture the physical aspect but also behind-the-scene aspects of what exactly happened from the time Kasab and rest of the team landed on Amar Singh Solanki’s trawler in the high seas, till Kasab’s heroic capture by the late Tukaram Ombale at Girgaum Chowpatty,” Varma said. The author of book “Kasab: The Face of 26/11”, Rommel Rodrigues, will assist Varma in the making of the movie. Both met a couple of times and had discussions on the script. “I have also spoken to many cops and victims of the attack as part of my research,” Varma said. The cast of the film will entirely comprise new faces to create a “heightened sense of reality”. Political circles here are abuzz with talks of a deal between Pawar and Yeddyurappa. Pawar, desperate to become the Prime Minister before time runs out for him, is on the lookout for a leader who can deliver the maximum number of Lok Sabha seats for him from Karnataka. Yeddyurappa is an ideal choice in this regard. For this plan to materialise, Yeddyurappa, of course, will have to break away from the BJP and go his own way. It is well known that Yeddyurappa, who is currently on bail in the various corruption cases he is facing, wants himself to be made the party’s Karnataka unit president in case he is not made the Chief Minister for a second time by the party high command. It is still not clear whether the BJP high command will buy peace with Yeddyurappa which will be seen as a compromise with corruption or it will sacrifice Yeddyurappa and let him walk over to the Pawar camp. Neither Yeddyurappa nor the NCP is, as yet, ready to publicly talk about a possible tie-up. However, the active interest being taken by Pawar in Karnataka politics has also become clear as a result of another development. It is learnt that a number of Congress and JD(S) MLAs apart from some Independent legislators are preparing to jump to the NCP. The names that have come to light in this connection are of seven Congress MLAs, one JD(S) MLA and three Independent MLAs. Congress MLA MV Guttedar, accompanied by other MLAs, met Pawar and invited him to visit Karnataka. Pawar asked the disgruntled Congress legislators from North Karnataka about the number of Lok Sabha seats that they could possibly win for him from Karnataka. Another influential politician being wooed by both the NCP and JD(U) is BJP rebel-turned-Independent MLA Sreeramulu. A close associate of the Reddy brothers of Bellary, he demonstrated his huge clout in the region by winning the recent byelection from the Bellary (rural) seat by a record margin despite the entire state government working overtime to ensure his defeat. Sharad Yadav is said to be the first to send feelers to Sreeramulu who is expected to visit Delhi soon to meet Yadav and Bihar Chief Minister Nitish Kumar. Sreeramulu, who has already announced the launch of a regional party, is talking about striking an electoral alliance with the JD(U). While the hospital authorities blamed the blood bank managed by the Indian Red Cross Society for supplying contaminated blood, the latter claimed they had undertaken proper screening of the blood samples. Twenty-year-old Haseena, belonging to Venkateswarapuram in Nellore district, was admitted to the hospital on November 2 for delivery. She was administered three units of blood during the surgery. She delivered a healthy child the next day. However, nearly a month after the surgery, she developed complications including high fever and vomiting. She was rushed to the same nursing home, where doctors got her blood tested for complete blood profile. To their utter dismay, she tested positive for HIV. She was then referred to a local corporate hospital for a second opinion. There, too, the tests proved that Haseena was infected with HIV. “We are shattered. All her previous medical reports indicated that she was HIV-negative. The doctors at the nursing home said the blood bought from Red Cross Society’s blood bank must be HIV-infected,” her husband Nissar said. He said he had purchased three units of blood from a blood bank operated by Indian Red Cross Society in Nellore. The doctors had administered her two units of blood before the surgery and another one after the delivery.